"never do anything stupid because some manager/MBA/suit-type has power without knowledge. " "Likewise, there are no "politics", just engineering." 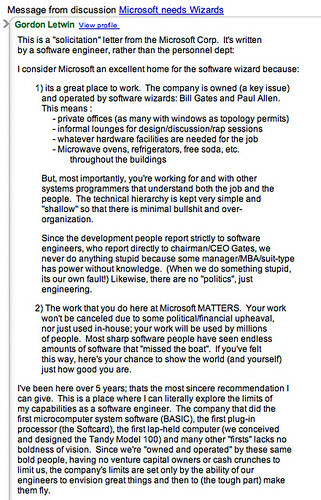 "Your work won’t be canceled due to some political/financial upheaval,"
Very cool, very history. MSFT is everything BUT this. A fat enterprise with more suits the nerds and more politics then code.